Sweet Roman showed up on the streets of Daytona in late September. He was underweight, unchipped and heartworm positive. He was estimated to be four years old. 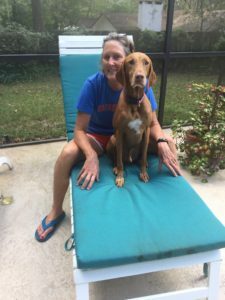 A Vizsla breeder in the area found out about him and rescued him from the shelter and fostered him for almost a month. In my mind, she saved his life. After he got his heartworm treatment he moved to his new forever home in Gainesville. He is having minimal side effects from his treatment and eating well. He is such a sweet boy and gives great kisses. We are starting to take him on short walks and he is very friendly with all the four-legged (and two-legged) kids he meets. He particularly loves lounging outside and staring down lizards.